Eggs are an everyday part of many people's lives, whether it's fried eggs for breakfast or a quiche for an easy lunch. From mayonnaise to birthday cake, eggs show up everywhere. Luckily, they're also a healthy addition to your diet, rich in protein and beneficial vitamins and minerals, which makes them a nutritious, versatile food. The amount of protein per egg depends on its size. One large egg has nearly 6.3 grams of protein, while a small egg has 4.77 grams. Eggs are well known for being rich in protein, but they range in size from peewee to jumbo. This difference in size can change how many nutrients you’re getting in each egg. According to the United States Department of Agriculture, a jumbo-sized egg weighs at least 2.42 ounces, making it twice the size of a 1.25-ounce peewee egg. Of course, a peewee egg and a jumbo egg won't contain the same amounts of nutrients. As an example, a jumbo egg will have about 8 grams of protein, while a small egg only has 5 grams. There's also a difference if you eat just the yolk, just the white or the whole egg. According to the United States Department of Agriculture, one large egg (approximately 50 grams) contains 6 grams of protein. If you were going to eat the same amount of pure yolk, this would be 7.93 grams of protein. The same amount of pure egg white is equivalent to 5.45 grams of protein. This is not too far off from the amount of protein in chicken, which is about 8.72 grams for per 50 grams. The recommended amount of daily protein is based on your weight but equals around 0.8 grams of protein per kilogram. Use the USDA's Dietary Reference Intakes calculator to determine how much protein you should be consuming per day. According to the American Egg Board, eggs have myriad other vitamins and minerals. Eggs contain vitamin A, D and E, as well as several B-complex vitamins (thiamin, riboflavin, niacin, pantothenic acid, pyridoxine, folate, and B-12). Eggs also contain lutein and zeaxanthin, which are good for your eyes. Both the Harvard T. H. Chan School of Public Health and American Heart Association recommend one egg per day as part of a healthy diet. Large grade eggs are the standard size typically used in recipes. Much more than one egg per day could be harmful to your health. According to an interview with the Harvard Gazette, Walter Willet, chair of the Harvard T.H. Chan School of Public Health’s Nutrition Department, said in an interview that eating too many eggs is linked to an increased risk of diabetes and heart disease. Because one egg a day is meant to be a good part of your diet, the real question is: What’s the healthiest way to eat eggs? Alone, they can be boiled, fried, poached or scrambled. They can also be easily incorporated into different types of foods, such as pancakes, quiche, soufflés or stir-fries. 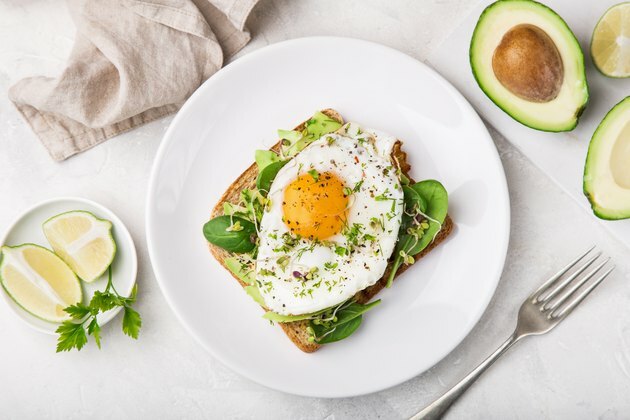 According to Jo Ann Carson, professor of clinical nutrition at UT Southwestern Medical Center in Dallas, as long as you’re not cooking eggs in unhealthy ingredients like bacon fat or butter, a daily egg can be a perfectly healthy component of your daily diet. The American Heart Association: Are Eggs Good For You or Not? How Much Fat Is in Egg Whites?